In this site, you will find an amazing package of learning tools that will make learning fractions for your student or child an easy, painless process, possibly even easier than when they learned the multiplication table. The history of my idea for this product comes from 17 years of math teaching, mostly to middle school students and struggling high school students. Learning fractions is an immense hurdle to all of math instruction. California and other state’s Math Standards introduce fractions over 2 to 5 years. 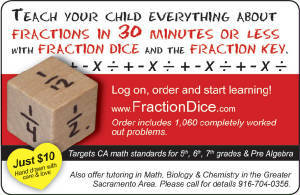 These dice and the accompanying download will last your family for many years of education. My teaching methods have several features that make them extremely powerful. The first is the design of the dice themselves. The set contains five dice. Three of the dice only contain a mix of fractions that you could make with an egg-crate, commonly called “egg-crate fractions”. These are the fractions that have all the completely reduced forms with the denominators halves, thirds, fourths, sixths, and twelfths. The egg crate fractions are usually called the “easy ones”. The other two dice contain a rich variety of fractions not possible on the egg crate, such as those fractions that contain the denominators fifths, eighths, and tenths. After dice purchase, you will receive a user name and password that downloads the 1,060 problems that these dice generate. The Fraction Key. The download instructions are in the package insert that accompanies the dice. 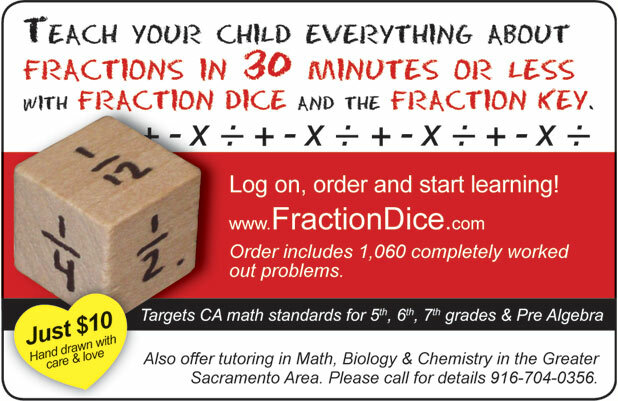 Staple or bind them as you please, and keep them handy whenever your child or student practices with the dice.